Rev Carmen Hernandez, was born in Rio Piedras, Puerto Rico On April 28, 1963. At the age 6 month old she move to New York City and has live in the Bronx ever since. On her mothers side, Rev. Carmen has nine brothers & sisters. Five brothers and four sisters and she is the eldest of her sisters. From her father side, she has another nine siblings. She is the CEO/Founder/Outreach/Pastor, Stratford Community Services, Inc.(Giving Kids/Youth a Chance). As an advocate/Activist in the Soundview section of the Bronx for the past 30 years, Rev. Carmen has helped empower at-risk inner city kids. Through her efforts and a list of activities that specifically target youth, Rev. Carmen has proved to be a vital part of the South East Bronx community. She has also coordinated Stratford Annual Back 2 School Jam Block Parties for two decades. Rev. Carmen was Honor Mentioned and awarded the Groundbreaker Latina Leader award in the United States in 2006 by Catalina Magazine. On April 22nd, 2009 Rev Carmen, won the NY State Regional & International Small Business Administration, “SBA” Award. Rev Carmen also was awarded the Rising Stars Awarding Winners for 2009 by the Department of Labor – Latino Job Service Employer Committee GALA. On Oct 27, 2009, NYC Council Speaker Christine Quinn, honor Rev Carmen at national clergy appreciation month reception. On Oct 29, 2009, Comité Noviembre, has awarded Rev Hernandez with the 2009 “Lo Mejor de Nuestra Comunidad” Award. 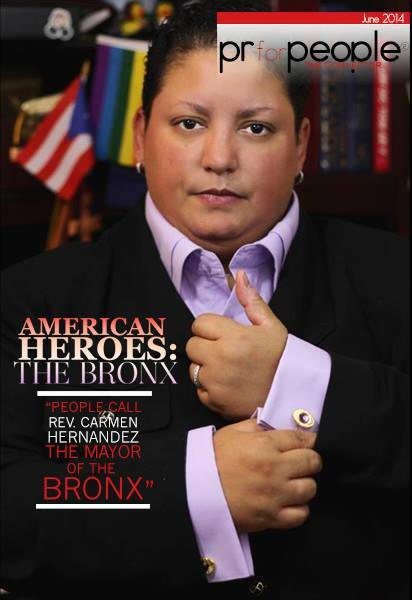 On December 5, 2009, Rev Carmen was awarded on as the Our Youth’s Hispanic LGBT Activist of the Year. El Diario has nominated Rev Carmen as a recipient of the 2010 “Mujeres Destacadas Award” a recognition given annually by El Diario La Prensa.